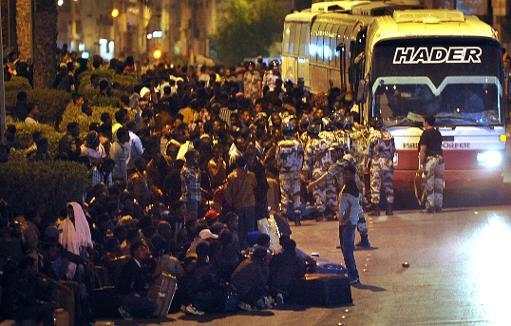 Saudi officials sent 50,000 Ethiopian illegal immigrants back to their home country. The final total once the mass airlift ends is now expected to be around 80,000. Ethiopia has flown home over 50,000 citizens in Saudi Arabia after a crackdown against illegal immigrants in the oil-rich state, the foreign ministry said Wednesday. “We projected the initial number to be 10,000 but it is increasing,” foreign ministry spokesman Dina Mufti told AFP, adding that the final total once the mass airlift ends is now expected to be around 80,000. Ethiopia started repatriating citizens living illegally in Saudi Arabia after a seven-month amnesty period to formalize their status expired on November 4, sparking violent protests between Saudi police and Ethiopian migrants preparing to leave the country. The Ethiopian government said three of its citizens were killed in clashes. Dina said the government is spending $2.6 million (1.9 million euros) on the repatriation program to bring citizens home, the majority women.